The Bethesda Big Train are set for their first playoff matchup of 2018, taking on the Silver Spring-Takoma Park Thunderbolts in the Ripken League semifinals. Silver Spring-Takoma Park finished the regular season 18-22, advancing to the semifinals after defeating the Gaithersburg Giants in a rain-delay play-in game on July 23. Only two players, Pearre and Beeman, finished the season batting above .300 for the Thunderbolts. The pair also leads the team in walks, Pearre with 24 and Beeman with 19. On the mound, Silver Spring-Takoma Park finished the season with a team ERA of 5.19 over 336 1/3 innings pitched. They have not announced a starting pitcher for game one of the series. For the Big Trian, who finished the regular season with a franchise-best 34 wins, to win the series a game one win is crucial. If the team, which includes the league-leaders in batting average and RBIs, can get ahead early and maintain a sizeable lead over the Thunderbolts, a game-one win is likely. Outfielder Justin Wylie (Arizona) led the team in batting average after the regular season, hitting .417 with seven home runs and 26 walks. He is followed by Alec Burleson (East Carolina), who led the team in home runs (10) and RBIs (44). 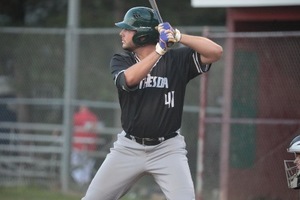 Tyler Villaroman (San Francisco) finished the regular season for the Big Train as the leader in walks (29) and stolen bases (21), with a .468 on-base percentage. Both Villaroman and Fox Semones (James Madison), who led the lead in hit-by-pitches (13), know how to get on base by any means possible, which will prove handy during the playoffs. The Big Train’s ptiching staff finished the regular season with a team ERA of 2.85 in 347 2/3 innings pitched. They have not announced a starter for game one of the series. First pitch is curently set for 3 p.m. at Shirley Povich Field, however due to rain that is subject ot change. Keep up-to-date with the date, time and location of the Big Train’s first playoff game by following the team on Twitter (@gobigtrain).